The Center for Equality and Social Justice will be distributing free copies of the book "So You Want to Talk About Race" by author Ijeoma Oluo beginning Wednesday, Jan. 30. 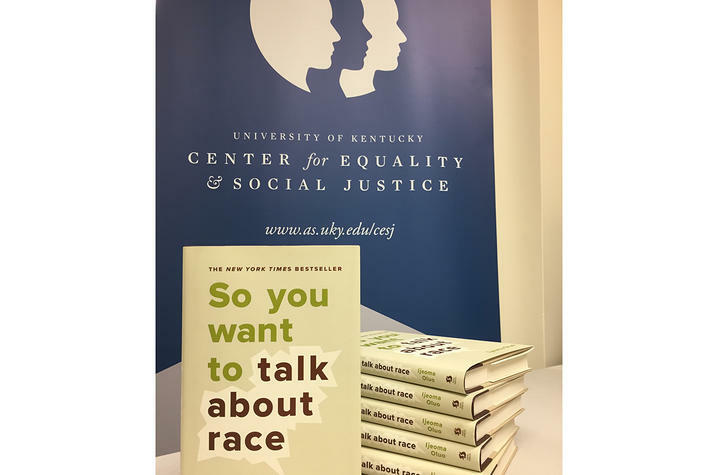 LEXINGTON, Ky. (Jan. 28, 2019) — The University of Kentucky Center for Equality and Social Justice will be distributing free copies of the book "So You Want to Talk About Race" by author Ijeoma Oluo beginning Wednesday, Jan. 30. Students can pick up their copy of the book at the CESJ office in Patterson Office Tower Room 351 and the Martin Luther King Center in Gatton Student Center Suite A230. Christia Spears Brown, director of the CESJ, said "I hope this book will give students of all races a different perspective, give everyone a common language, and help start a productive conversation about how to move forward toward greater racial equality. The only way to move toward greater inclusion and equity is to acknowledge and discuss the current inequities." "So You Want to Talk About Race" is a New York Times best-seller. Oluo offers a contemporary, accessible take on the racial landscape in the United States and addresses numerous issues, including privilege, police brutality, intersectionality, micro-aggressions and the Black Lives Matter movement. The book is perfectly positioned to bridge the gap between people of color and white Americans struggling with race complexities. Oluo is a Seattle-based writer and speaker. She has been named one of The Root's 100 Most Influential African Americans in 2017 and one of the 50 Most Influential Women in Seattle by Seattle Met. Oluo won the 2018 Feminist Humanist Award by the American Humanist Society. Her work primarily focuses on issues of race and identity, feminism, social and mental health, social justice, the arts and personal essay. The books are funded by a UK Inclusive Excellence Grant. The CESJ collaborated with the Martin Luther King Center and the Department of African American and Africana Studies on this book discussion. Oluo will discuss her book on campus Tuesday, March 26. The first event is a social justice book club meeting with free food at noon. She will then give a campus-wide address that afternoon at 3 p.m. The address is open to the public and reading the novel is not required. For more details, visit the event website.